Bureaucratizing the Good Samaritan is about the organization of refugee relief programs. It describes the practical, political, and moral assumptions of the ?international refugee relief regime.? Tony Waters emphasizes that the agencies delivering humanitarian relief are embedded in rationalized bureaucracies whose values are determined by their institutional frameworks. The demand for ?victims? 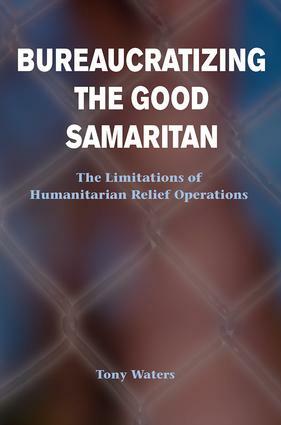 is observed in the close relation between the interests of the popular press and the decisions made by bureaucracies.This presents a paradox in all humanitarian relief organizations, but perhaps no more so than in the Rwanda Relief Operations (1994-96) which ended in the largest mass forced repatriation since the end of World War II. This crisis is analyzed with an assumption that there is a basic contradiction between the demands of the bureaucratized organization and the need of relief agencies to generate the emotional publicity to sustain the interest of northern donors. The book concludes by noting that if refugee relief programs are to become more effective, the connection between the press's emotional demands for ?victims? and the bureaucratic organizations's decision processes need to be identified and reassessed. How Many Refugees Are There in Ngara?